Chickens were smaller in colonial times, in case you were wondering how Simmons fit six chickens in one pie (I’m guessing it was also a very big pie). The idea of putting whole birds in pastry is also not as strange as it might seem — in the pre-refrigeration age, meats were often baked in pies to preserve them longer. I knew my family would never go for a pie full of chicken bones and that much butter, so I made a recipe from the Kings Arms Tavern at Colonial Williamsburg that had de-boned meat and just one stick of butter. Even this was too rich for our tastes. So I tried again, loosely following the same recipe but halving the butter and mixing in an egg yolk to thicken the sauce a bit. The pie was slightly drier, but still delicious. 1. Place the chicken in a large covered soup pot. Add celery, onion, bay leaf, salt, and pepper. Add enough water to cover and bring to a boil over high heat. Reduce the heat to medium low and simmer, partially covered, until the chicken is very tender, about 1 1/2 hours. Skim the broth. Remove the chicken and cool. 2. When the chicken has cooled, remove skin, bones, and gristle and cut into large pieces. Strain the broth and discard the solids. 3. In a medium saucepan over medium-high heat, melt the butter. Add the flour and stir until well blended and lemon colored, about 2 minutes. Slowly add 1 1/2 cups chicken stock, stirring constantly. Reduce heat to medium and simmer a few minutes, until slightly thickened. Whisk a little of the sauce with the beaten egg in a small bowl, then add that mixture back to the sauce, blending well and cooking briefly. 4. 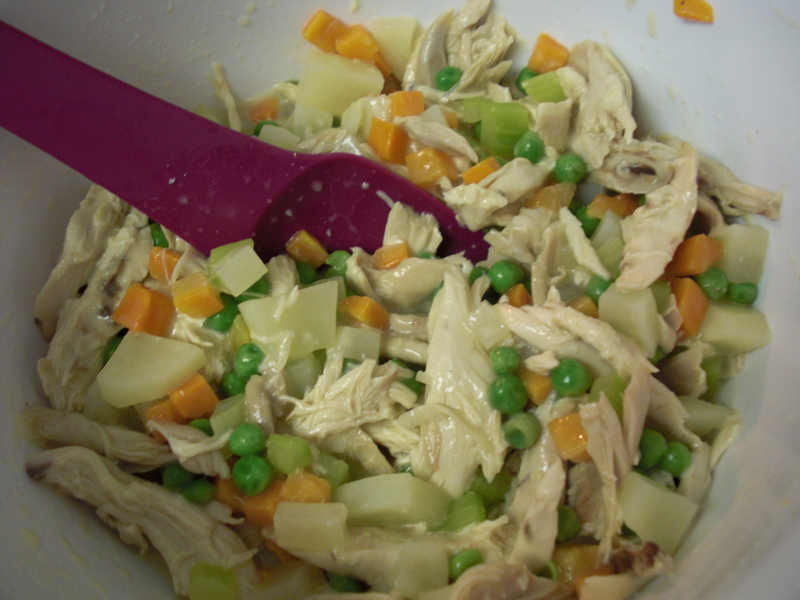 In a large bowl, combine the carrots and peas, remaining 2 celery ribs, and potatoes. Add the chicken pieces and sauce. Season with salt and pepper to taste, and stir. 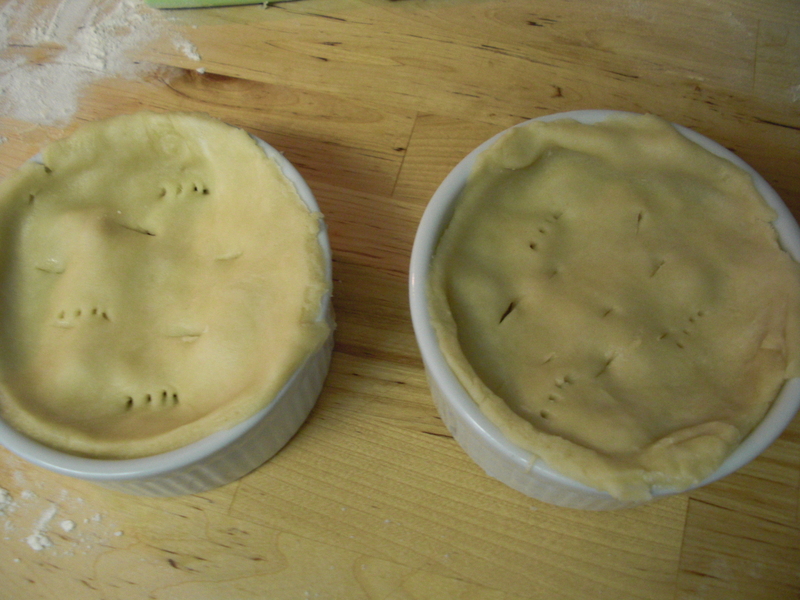 Cut out circles slightly larger than the ramekins, then place on top of the filling, pressing the edges to the sides of the dishes. Use a sharp paring knife to cut a small hole in the center of each dish to allow steam to escape. Prick the pastry with a fork. Brush the dough with the beaten egg mixture, and bake until crusts are golden brown and the filling is bubbling, about 35-40 minutes. Serve hot. 1. Into a large bowl, sift the flour with the salt. 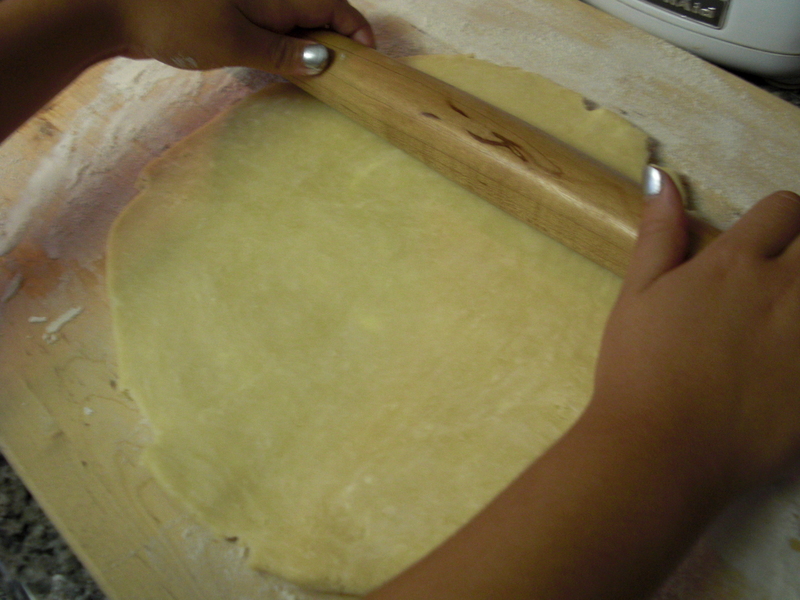 Add the butter and shortening and cut into small pieces with two knives or a pastry cutter. 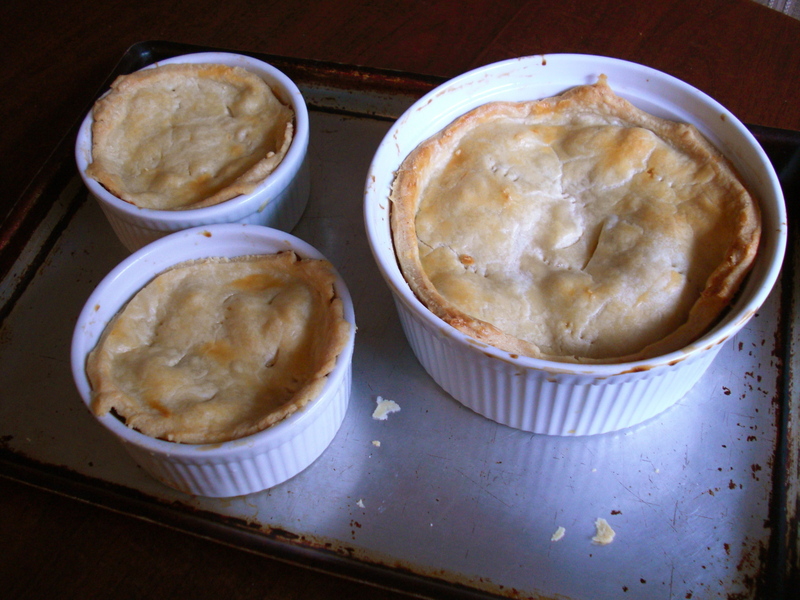 This entry was posted in pies, poultry and game and tagged Chicken, Colonial Williamsburg, Pot pie by revolutionarypie. Bookmark the permalink.